"I was ironing and one of the little girl's dresses got burned," says Daya*, a Sri Lankan woman working as a live-in maid for a wealthy family in Kuwait. Daya knew "Madam"—the wife of the house and her employer—would be furious. And she was: Madam took the iron and burned Daya on her wrist and the back of her neck. "Then she pulled me by my hair into a storeroom with one tiny window," says Daya. "For two days I was shut in there with no food or water. It was dark." Daya had arrived in Kuwait in 2006, knowing from previous work in Oman that being a maid was hard. In Kuwait, she worked from 3 a.m. until late in the evening seven days a week, keeping house for her employers and their 5 small children. She washed and cooked; she cleaned clothes and floors; she looked after the kids while Madam went to her computer job. Daya was locked in the house and had no key. So far, nothing was that different from what many maids like her experience in the Middle East. But when Madam starting locking the cupboards and refrigerator, Daya worried. "Slowly they reduced the quantity of food. They were throwing away food and I was hungry," she says. The water taps could also be locked, and so most days she couldn't take a bath. "They would fill a small basin and then turn off the water." Madam became more and more brutal. "She would inspect the house, and if she was not happy, she would beat me," Daya remembers. Daya's story is not an isolated case. Hundreds of thousands of women from poor countries go to the Middle East each year to be maids for rich families. They are usually told they will earn $100 a month—much more than they could earn at home. And while many maids are treated well, a significant number face extreme—even bizarre—cruelty. Locked in houses or apartments with no access to phones, often unpaid for months or years, they are slaves. "When I requested my full salary, they started beating me," says Lakshmi*, a Sri Lankan woman who is now 23. "They bit me on my arms. It left marks." Her Kuwaiti employers—who, to stop her salary complaints, withheld food and water to the point where she fainted—became more violent. One day, her employer pushed her out a large open window. Lakshmi fell two stories. A year after the fall and back in Sri Lanka, she can walk again—with pain. When one Sri Lankan woman returned home from Saudi Arabia, her family noticed she was in pain. Too frightened to tell the truth, she said she had been injured by thorns from a date tree. X-rays showed that more than 13 nails had been driven into her hands and feet. Abusive employers take their maids' passport, restrict phone access, withhold money, and do what it takes to keep their maids isolated from help—not always difficult when the maids don't speak the local language. Indrani, a Sri Lankan woman now in her late twenties, was kept in her employers' high-rise apartment in Lebanon for eight years. "I was always locked in. If Madam went to the bathroom, she took the key with her. The four walls were like a prison." Indrani's family in Sri Lanka called many times, trying to reach her. On the phone with them, Indrani's Madam would say she had a Filipino maid, not a Sri Lankan. "Madam told them I was dead." The husband or grown sons in a family may consider the maid their sexual property. Some wives become jealous and beat the maid; other wives may encourage their maids to "agree" to husbands' demands so the wives do not have to. Chandrangani, a Sri Lankan maid who was beaten so badly that she returned to her homeland in a wheelchair, remembers maids she saw at her embassy in Kuwait. "Some were pregnant—some from the employer, some from the family's driver." Catholic Relief Services' partner Caritas is fighting to keep maids safe from abuse. Reaching out to some of the 200,000 Sri Lankans who go abroad to work every year, Caritas Sri Lanka and local Catholic groups make sure people know the risks of migration. "The ordeals that some maids go through are appalling," says Father George Sigamony, director of Caritas Sri Lanka. "After a few women speak about their trauma, a lot of women come forward." Raising awareness among vulnerable populations is key. "We go to rural villages and educate people," says Father Roy Clarence of Sri Lanka's Catholic National Commission for Migrants. His group puts up posters and hands out leaflets in churches, Buddhist temples, mosques, and government offices in Sri Lanka; they also distribute a docudrama and show the DVD in villages. Catholic groups warn people about unscrupulous employment agencies who prey on the poor, promising good jobs abroad but not delivering. "Sometimes agents take the money and run. Some people have sold their homes to pay agents," says Father Roy. Even when agents are honest and employers are kind, it can cause trouble for a Sri Lankan family when the wife goes away for a year. "If the mother goes abroad, the husband might start drinking, or the oldest sister might have to leave school to take care of the kids," says Father Roy. Instead of paying for tuition or food, the husband or older children might misuse the money the wife sends home. And "if both parents are abroad, often kids don't go to school," says Father Roy. In the very best cases, maids make money and help their families, but sacrifice time with their own children. "When I returned to Sri Lanka, my son was five years old," says a woman named Chandra who was treated kindly by her employers in Singapore. "He did not recognize me. It took him three days to get used to me." For people who do decide to go abroad, Caritas provides information and guidance that can prevent tragedy. Caritas encourages people to keep copies of their passport in their home country and to give their employer's address to family members. It also runs a program for 450 children of migrants, so that they're not forgotten when a parent is away. Caritas has become known for helping migrants in trouble. In Kandy, a city in Sri Lanka, the local Caritas gives legal advice and psychological counseling to Lakshmi and other abused maids. When Father Camillus Jansz of Caritas Kandy gets a call in the middle of the night from a 966 area code, he knows that it's Saudi Arabia—and that a maid there probably needs help. 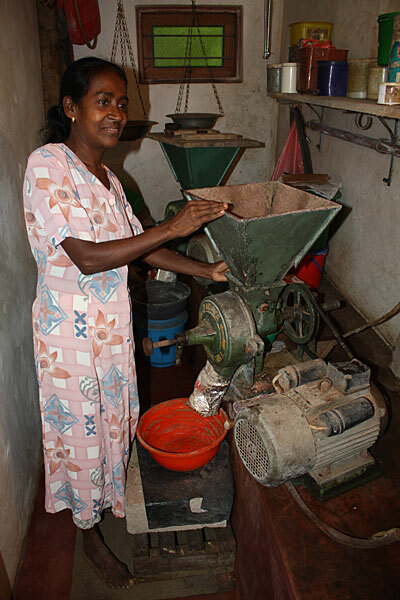 Most importantly, Caritas offers Sri Lankans—especially women—alternatives to migration by training them to start small home-based businesses. Participants learn gardening techniques, soap-making, poultry-raising, baking, and more. Caritas also gives small loans to strong, entrepreneurial women. Daya is one of them. She escaped Madam after a year thanks to her sister, who was also working in Kuwait. "I wasn't allowed to contact my sister, but one day she came to the house and I spoke to her through a window," says Daya. "I told her I was having trouble." Eventually Daya got home—though without 8 months' salary. Now 41, Daya has used her Caritas loan to start an incense-making business. In a small house crammed with red- and black-painted bamboo sticks, she deftly rolls incense dough, getting ready for upcoming Buddhist holidays when people burn incense at temples. "The April and June festivals are our busy time," she says. Daya employs 75 neighborhood women who do part-time incense-making for her from their homes. "I'm earning more than I did as a maid in Kuwait," she says. Like Chandra, Daya has joined a Caritas group called "Rakawana Howla"—Guardian Gathering—which counsels women who are going overseas to work. "I am proud that I am earning and that I've created jobs for other people in my neighborhood," Daya says. "Now we are happy. We have enough." *Some names have been changed to protect identity.